The Youth Fair Championship kicked off yesterday afternoon in the typical Miami heat and humidity, and at the difficult course at Larry & Penny Thompson Park. The weather conditions wreaked havoc on the athletes and while the times weren't expect to be too fast because of the sun, many were just satisfied with not passing out before the finish line. As the day rolled on the weather improved slightly, and the races did not disappoint as some new country champions were crowned this season. Photo Album by Teri Bernhardt-Rodriguez - Over 1,00 photos!! Video Footage - coming soon! The girls and boys JV races were both cut from the same cloth. On the female side, Lourdes Academy showed their heavy dominance for the second week in a row as they placed 3 girls in the top 4, and 7 girls in the top 15 to pull off a major team victory by a margin of 41 points. Once again they showed their depth and strength to their Miami counterparts as their 53 girls made up 30% of the racing field! 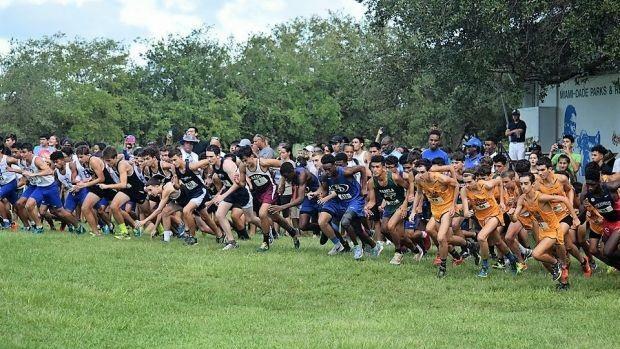 On the boys side, Belen JV was fresh off their perfect score finish from last week's Fleet Feet Invitational and so they created their own expectations to live up to. Although not taking the top 13 places like they did last week, 13 out of the top 15 is just as good in my book as they brought home the win by a margin of 45 team points. And let's not forget the very solid 63 second 1-5 spread. Eight of the top ten girls JV individual finishers with Coach Larry Wooten in the background; individual champion Milana Tirse is top right. The impressive Lourdes JV team champions army with Head Coach Rebecca Rodriguez-Michalak. The top ten boys JV individual finishers; individual champion Giancarlo Benitez is top right. The dominant boys JV squad of Belen Jesuit with Assistant Coach Rene Medina. The weather improved slightly for the varsity races and those athletes that appeared to be more poised in the first mile came back up on their competition in the back half of the course. Alana Batista of Lourdes and Rahyah Andressohn of South Dade were jockeying for position through the first mile while a three-pack of Braddock girls cruised behind them slowly creeping up by the halfway mark. As the race progressed Bastista and Andressohn finished third and fourth respectively as they were overtaken by Fernandez and Bergnes, two of the three pack, while Perez of Braddock finished in the number five spot. Placing three girls in the top five set up Braddock to come home with a big victory beating Lourdes by a 22 point margin. Interesting historical note, while I don't have the entire history of the Youth Fair Championship on hand I do know that in the past 19 years only two schools had won the girls championship; Lourdes Academy from 1998-2010, and John A. Ferguson HS from 2011-2016. Therefore with the Braddock girls pulling in the win, it marks only the third girls team to win the Miami-Dade County Championship in the past 20 years. Note: Ferguson HS did not attend the competition this year to defend their title. Eight of the top ten girls varsity individual finishers; individual champion Maria Fernandez is top right. The girls varsity runner-up team, Lourdes Academy, with Head Coach Rebecca Rodriguez-Michalak. The girls varsity championship team, G. Holmes Braddock, with coaches Carlos Cano (left) and Alex Shaw (right). Just as in the girls varsity race although not quite as hot as the JV races, those individuals who showed more poise in their first mile reaped the benefits later on in the race. Through the mile mark Collins of Belen led Cavan Wilson of Coral Gables and Fernandes of Columbus, and in the team race it was essentially dead even between Belen and Columbus through the #4 runners with the slight team edge given to Belen with the placement of their 5-6-7. Moving into the halfway mark of the course the individual race stayed the same and in the team race, the Belen pack started shifting up for a slight lead but the second half of the race came on hard for some. In the end, Joshua Collins of Belen had a solid edge over Deshay Fernandes of Columbus while Cavan Wilson of Gables dropped to fifth behind Torres of Braddock and Roa of Belen. Besides a two-pack from Coral Reef HS, Dobbs and Redondo, no one else was able to break up the 3-4-5 punch of Belen as they placed five in the top ten, and six inside Columbus' #2, to bring home the gold. When all was said and done Belen had a 61 second spread, a 42 point margin of victory, their second consecutive county championship, and 9th in the past 11 years. Note: Belen did not attend in 2015 making their winning streak 7 in a row when they made an appearance at the county meet. The top ten boys varsity individual finishers; individual champion Joshua Collins is top right. The boys varsity runner-up team, Christopher Columbus, and Head Coach Eric Pino.